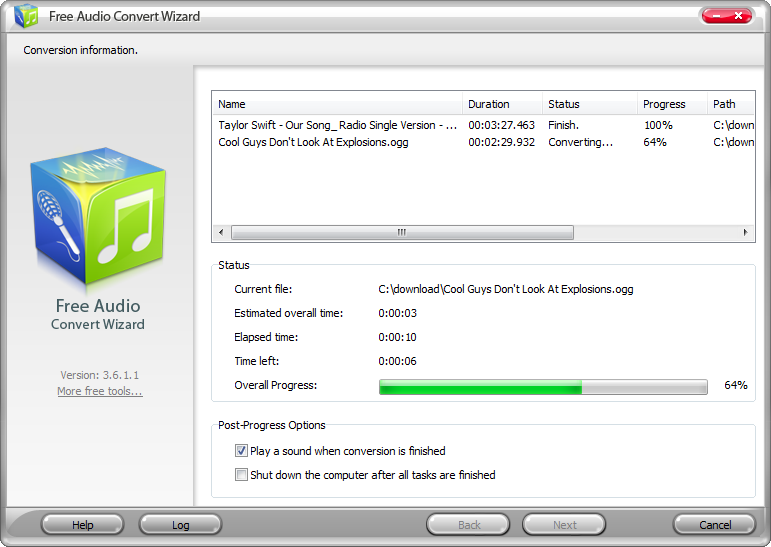 Want to convert MP3 songs for your music player? Free WMA WAV MP3 Converter is a brand-new tool for audio conversion. Free WMA WAV MP3 Converter is the most powerful yet user-friendly audio converter which helps you convert audio files between many audio formats as well as extract songs from videos. ...... It not only provides an easy and completed way to convert between all popular audio formats, such as MP3, WAV, WMA, OGG, AAC, M4A, FLAC, MP2, etc. but can convert video files including AVI, MPEG, WMV, ASF, MOV, MP4 and 3GP to your favorite audio formats. Each format is provided with a preset list in order to get a precise result. Free WMA WAV MP3 Converter helps you convert audio/video files of almost all popular formats to MP3 to enjoy in your MP3 player. It also converts audio files between many audio formats and supports almost all audio input (output of MP3, WMA, WAV, OGG, AAC, M4A, FLAC & MP2 supported). It enables you to extract audio segment from various videos including movies, YouTube videos and music videos. With it, you can convert videos of various formats into MP3 and other audio formats. It provides high-speed audio conversion with multi-core CPU processing fully supported. Resample audio files with different bit rate. Qweas is providing links to Free WMA WAV MP3 Converter 3.8.8 as a courtesy, and makes no representations regarding Free WMA WAV MP3 Converter or any other applications or any information related thereto. Any questions, complaints or claims regarding this application Free WMA WAV MP3 Converter 3.8.8 must be directed to the appropriate software vendor. You may click the publisher link of Free WMA WAV MP3 Converter on the top of this page to get more details about the vendor.